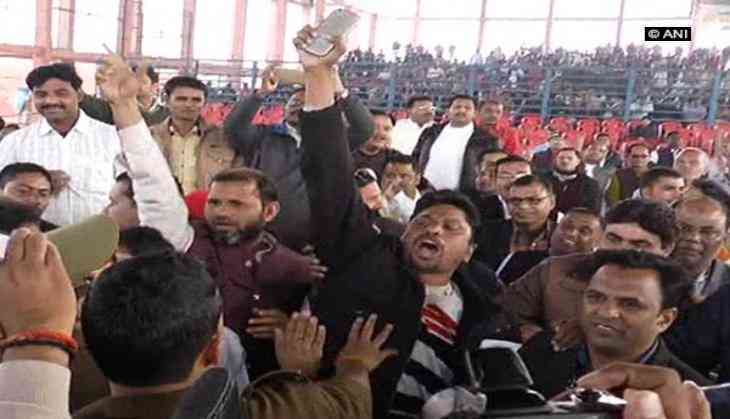 Pandemonium broke out at Aligarh Municipal Corporation as a scuffle erupted allegedly between the members of BJP and BSP after the newly elected Mayor Mohammad Furqan took his oath in Urdu. The incident came to light yesterday when the newly elected Mayor and BSP corporators took oath in Urdu that created uproar among the opposition. "Some people objected and raised slogans during the ceremony. We received information that a Councillor tried taking oath in Urdu," said Aligarh District Magistrate Hrishikesh Bhaskar Yashod. He further said they will probe the recording after which appropriate actions will be taken. "We will probe recording of the ceremony and take action if we find this to be true," said Aligarh DM Yashod. The DM also claimed that no religious slogans were raised. The pandemonium was stopped when the police authorities in the state interfered.